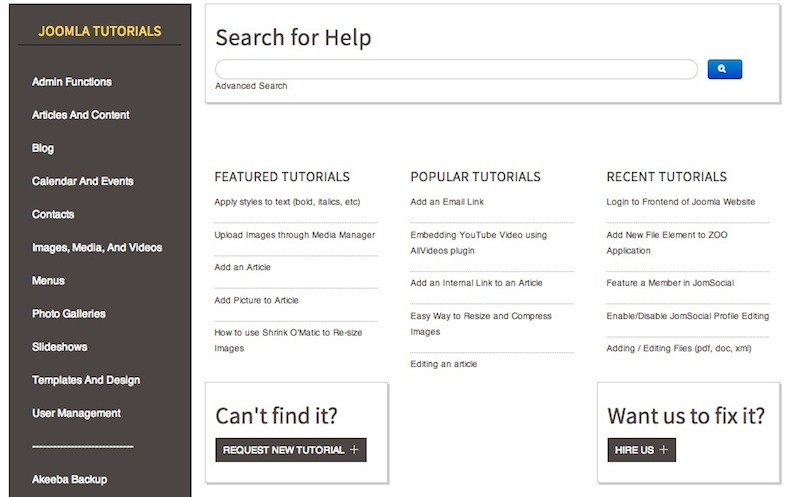 The categories for the tutorials are on the left and that menu is constant throughout the knowledge base. Categories that are part of core Joomla are on the top and tutorials for 3rd party extensions are listed below. Most likely you are looking for help for a specific problem. Now the search block is prominent at the top. It uses the core Joomla "Smart Search" to auto suggest topics. The "Featured Tutorials" shows specific tutorials our staff thinks are important. "Popular Tutorials" shows the topics with the most page views and "Most Recent" shows the newest by date. We know there are many tutorials still needed. In the bottom left is a button to easily request a new tutorial. You may just decide that you would prefer for us to take care of your issue. The button in the bottom right allows you to submit a support ticket directly to us. If you are on a current maintenance planmaintenance plan, we will take care of the issue immediately. If not, we can send you more information about our plans or let you know what our estimated turnaround time is. Next to the title of each tutorial, we have an icon indicating which version of Joomla the tutorial applies to. We are currently generating many new tutorials for Joomla 3.2 which is the newest version (and the one that all maintenance clients are on). What else would you like to see in our tutorial section? Leave comments to let us know how we can help you even better! Alexis moved to Waco in 2008 after five years in the United States Army as a military police officer. Web design was a hobby that grew into a passionwhile she was in the military. She is the founder of ArmyToolbag.com, a reference website for Army personnel that averages over 25,000 unique visitors a month. When she sold that website to a national marketing firm, she decided to venture out and start YellowWebMonkey Web Design in 2009. She has a Bachelor of Science degree in Psychology and Computer Science Engineering from the United States Military Academy at West Point, NY.